Q: Why did you choose a fellowship at Gillette? 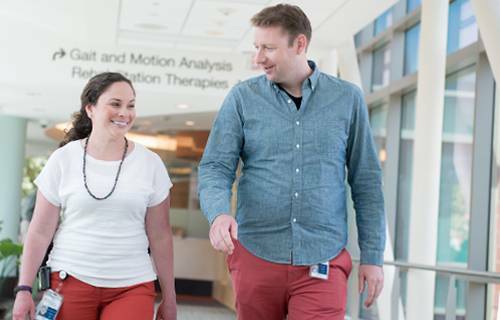 Amy: When I came to Gillette I wasn’t exactly sure what to expect, but when I interviewed it became clear that the fellowship here offered exposure to nearly every aspect of care that pediatric rehabilitation physicians provide. This only became more apparent in my subsequent interviews at other sites. Some fellowship sites would have a therapy pool, but they wouldn’t have a gait lab. Some places do phenol injections, but they don’t manage baclofen pumps. At Gillette we manage 700-800 per year. A lot of programs are just starting up rhizotomy. We do four a month. I knew that Gillette would give me the opportunity to learn everything I needed to be successful in my career. Jeffrey: To echo what Amy said, all of the programs offer a little bit of everything, but it’s rare to see it all in one place. That’s what we have at Gillette. I think the fact that it’s a small hospital throws some people off. While it’s a smaller organization in some respects, because we specialize primarily in treating children who have medically complex conditions, we have a much higher volume of patients than you would see at many larger academic institutions. Going along with this, the fact that we’re smaller becomes a strength. The care that we provide is truly multidisciplinary, because you know and work with everyone. Q: Describe how the various specialists and subspecialists work together at Gillette. Jeffrey: It’s incredibly collaborative. You would think that the complexity of our patients would demand such an approach, but depending on the site, that’s not always the case. At a larger institution, you might not work with Neurology or Orthopedics on a daily basis, and even if you do, you’re not going in as a team to see patients. Here, we all come together in the same room to assess the patient, leave, discuss the best course of action, and then go back to the patient and his or her family with a plan. I don’t know anywhere else that does that, and to me, that’s what made Gillette truly stand out. Amy: Also, from the perspective of a rehabilitation physician, I think it would be safe to say that at Gillette our input is valued in a way that doesn’t happen everywhere. Since everything is discussed as a team, there’s a greater shared investment in the overall outcome for the patient, and having these discussions gives you an opportunity to ask questions that you wouldn’t be able to address in a less team-oriented setting. These 1:1 interactions are so incredibly important, and this approach to care provides an atmosphere of greater equity between yourself and those with whom you’re working. Q: How would you describe the mentorship you’ve received at Gillette? Amy: One thing that I think is easy to overlook is just how many Pediatric Medicine and Rehabilitation faculty Gillette has on staff. Similar to the experience we get working with a higher volume of patients, working with multiple faculty members who come from different backgrounds and areas of focus exposes fellows to a fuller variety of teaching styles and methods of approach. All of this comes together to provide a broader foundation upon which to develop your own individual skills and interests. Jeffrey: For me, it’s not enough only to learn what the final course of action is, I want to learn why our specialists make the decisions that they do. Since we’re all in the same room together, you get to pick the brains of those around you on a daily basis. Some programs only have a few faculty members and if you don’t necessarily connect with them, there’s not a lot you can do. By the seemingly simplistic benefit of having more people in the room, at Gillette, you get more options and examples to choose from as you to start to define what you want your own individual approach to be. It’s the perfect environment in which to learn. Q: What would you tell a prospective fellow who is considering interviewing for our fellowship at Gillette? Amy: Absolutely, come to Gillette to interview. Obviously, having gone through the process I know that everyone has to be selective in choosing which interviews to take, but you truly won’t regret it. Being from Louisiana, I didn’t really know that much about Gillette or Minnesota, and I’m not sure if I really had any expectations, but you don’t have to spend very long here to see that it’s a special place. This is also why I chose to stay on staff here after the end of my fellowship. So, my advice is make the trip, it could change your life like it changed mine. Jeffrey: I had a very specific mindset regarding what I was looking for in a program, but it was a previous instructor who told me to seek out Gillette. Once I came here and saw everything that Amy described, I knew what my decision was going to be. While I had an understanding of how I would feel about the fellowship, what I didn’t know was how I would feel about the region, and living in the Twin Cities. You tend to hear about the winter a lot when it comes to Minnesota, but the spring and summer are beautiful, the cost of living is low, and between all of the restaurants, parks and bike trails, there are so many things to do. It’s a great place to live for single people; it’s a great place for families. Between that, and the exemplary opportunity to work and learn that Gillette provides, to echo Amy, interview here, you’ll be glad you did.